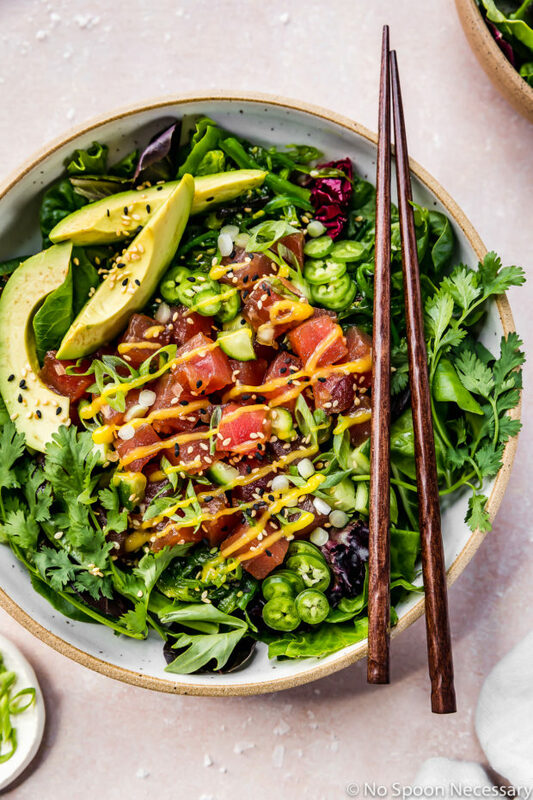 This Avocado Mango Tuna Poke Salad Bowl recipe swaps out sushi rice for greens and is essentially a ‘how-to’ build your own healthy ahi poke bowl! 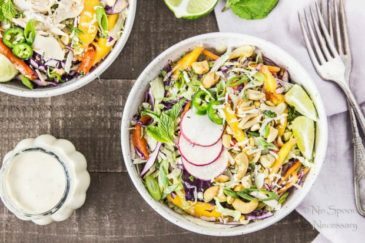 Complete with optional toppings, add-ins and a ridiculously easy to make mango dressing, this salad is perfect for lunches or easy, light dinners! How was your 4th of July and (hopefully) extended holiday weekend? Or, if you live in Canada, how was your Canada Day?! Or, if you reside in another country, how was your regularly scheduled weekend? Mine was fantastic! My mother and MOD (my other dad) came up from FL to visit and celebrate my birthday (it falls 2 days after the 4th) and we had a wonderfully relaxing time. But, do you know what I realized? I just can’t handle fun like I used to. Now, don’t get me wrong here. I can still be fun, it just takes me several days to recover from all the fun. I definitely miss my twenties in that sense. Anyways, I am assuming most of you ate too many hamburgers, hotdogs, kebabs, and creamy fattening sides over the holiday. 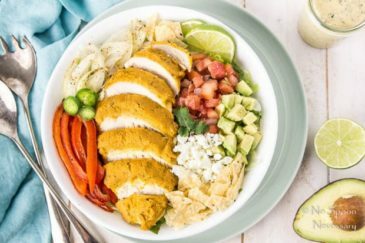 So, today we are doing it up with a healthy, colorful, protein packed, power bowl of YUM. Fresh, sushi-grade tuna tossed with sweet onions and a flavorful Asian-Hawaiian fusion marinade. 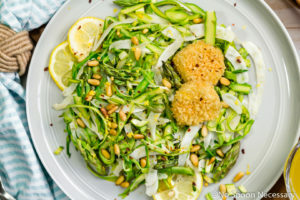 Served on a bed of crisp lettuce tossed with savory seaweed salad, crunchy cucumbers and creamy avocado; then generously drizzled with a tropical, fruity mango dressing. Basically, this tuna poke salad bowl is giving me ALL the summer feels. It’s fresh, healthy, packed with good for you ingredients and it’s downright delicious too! Not to mention, this poke bowl is like eating the rainbow! I mean, just look at that jewel-tone colored tuna with pops of green and drizzle of vibrant yellow mango sauce! 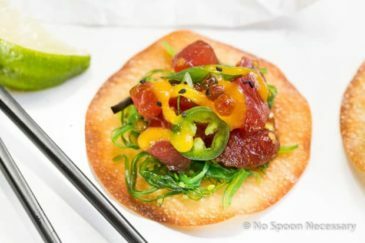 What is Hawaiian tuna poke bowl? Hawaiian tuna poke bowls have become a popular food trend, and for good reason. Hawaiian poke bowls are quick, healthy and perfect for satisfying a sushi craving on a lower budget. 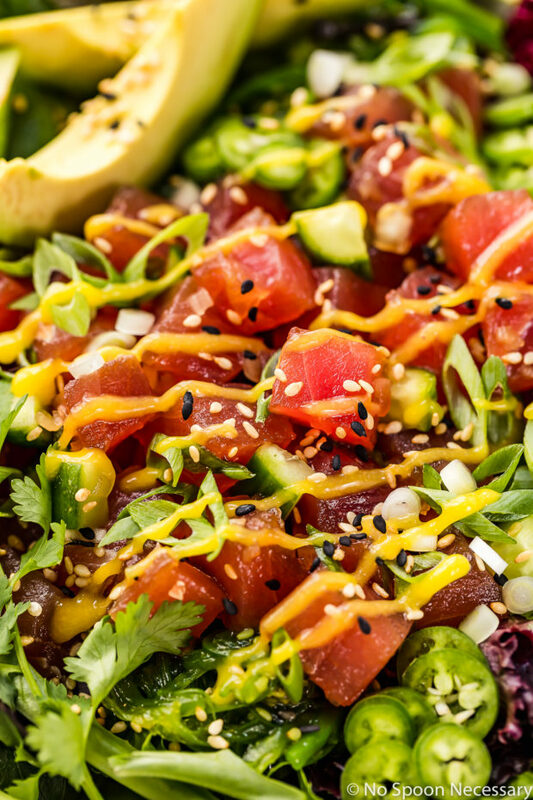 The main component of poke bowls is tuna poke. 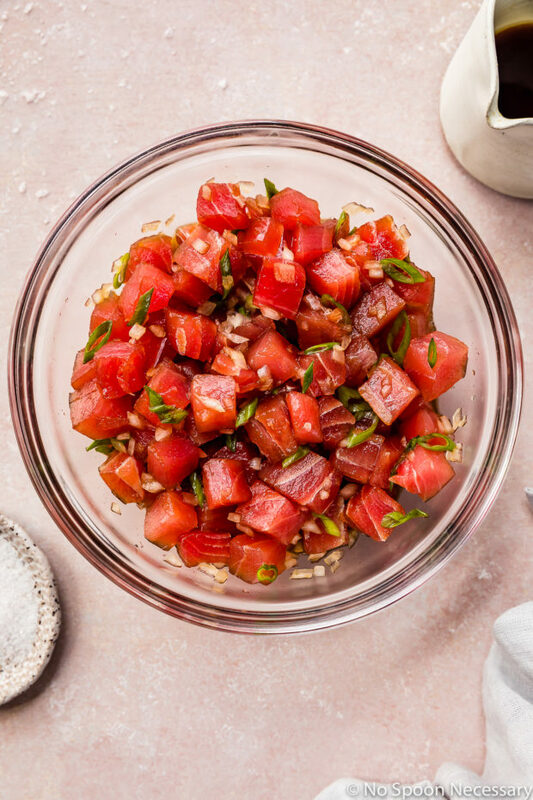 Poke (pronounced “POH-keh”) literally means “to cut or slice” in Hawaiian, and the word refers to bite sized pieces of raw fish – most commonly tuna – which is marinated in a soy sauce mixture. Traditionally poke bowls consist of poke served over sushi rice, then topped with various vegetables, sesame seeds and umami-spiked sauces. 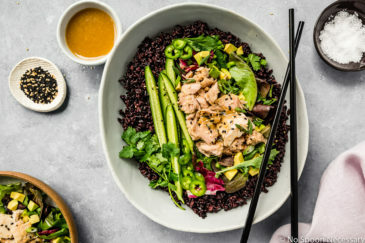 In this tuna poke salad bowl we are nixing the rice and opting for healthier greens, while 86-ing the spicy, creamy sauce and substituting a mango based dressing. Are tuna poke bowls healthy? While Hawaiian tuna poke is healthy, whether or not your poke bowl is healthy completely depends on what else you are adding to your bowl. 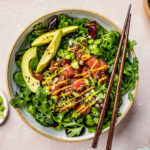 A tuna poke bowl loaded with sushi rice, avocado and spicy sauce is going to have a lot more calories and be considerably less healthy than this Avocado Mango Tuna Poke Salad Bowl recipe. 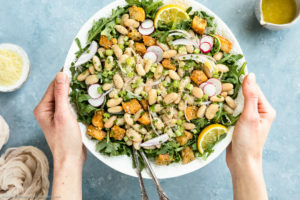 However, no matter how you load-up, layer, or garnish your poke bowls, they are nutrient dense and do contain a high amount of protein and healthy fats, such as Omega 3. 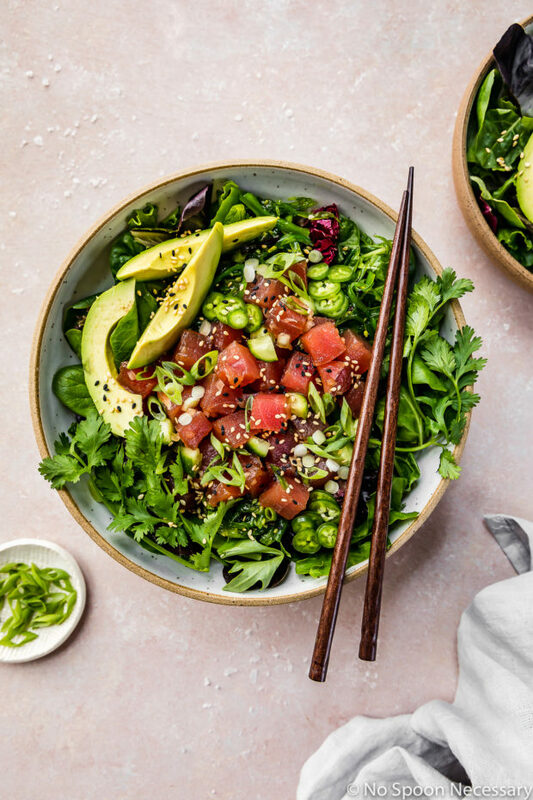 The main key to keeping your poke bowl super healthy is to make sure you are customizing yours to include more greens, fruits, and vegetables and less processed ingredients. 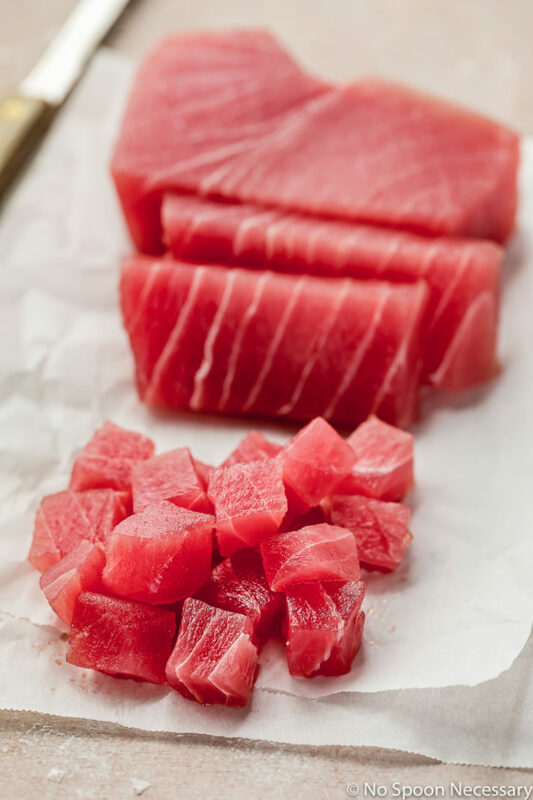 While the recipe below calls for sushi-grade tuna, you can absolutely substitute the tuna for any seafood you would like, just make sure you are using sashimi quality fish, or cooked seafood. Sushi-grade salmon, octopus, scallops or cooked crab are delicious options for this poke salad bowl! The tuna poke will keep, covered, in the refrigerator for up to one day, however, it is best if eaten on the same day it is prepared. The add-ins for the avocado mango tuna poke salad bowl are pretty limitless. 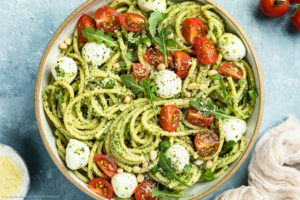 I have included a ton of options in the recipe below, but feel free to use your imagination and top your bowl with whatever your heart desires! The amount of water needed for the mango dressing depends on your preferred consistency for dressing. I recommend starting with 1 tablespoon and adding more water, an additional tablespoon at a time, until desired consistency is achieved. For reference, I used 1 1/2 tablespoons of water in my dressing. The same note applies to the honey and sriracha in the dressing. Always make a recipe your own by adjusting the measurements of ingredients to your taste. This Avocado Mango Tuna Poke Salad Bowl is healthy and hearty, plus packed with both nutrients and flavor! Easy on the eyes and even easier on the taste buds, this poke bowl is salad goals!! Until next week, friends, cheers – to sushi in a bowl! 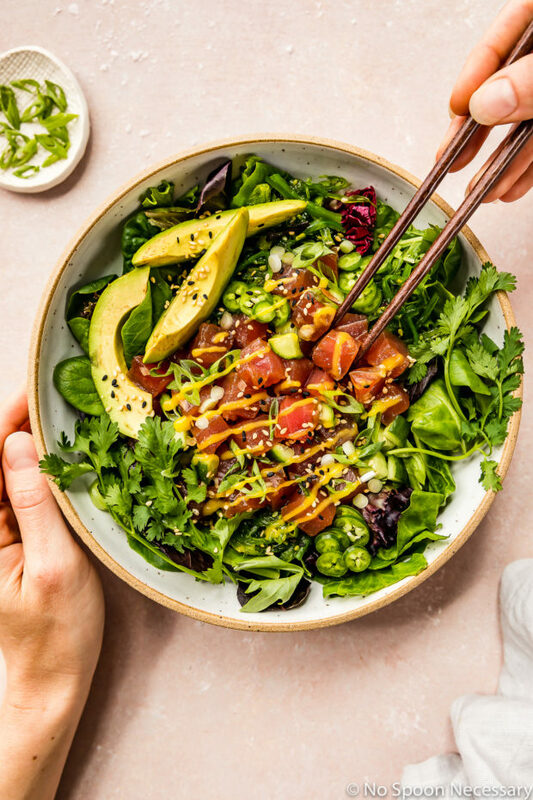 This Avocado Mango Tuna Poke Salad recipe swaps our sushi rice for greens and is essentially a ‘how-to’ build your own healthy ahi poke bowl! 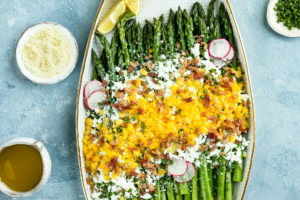 Complete with optional toppings, add-ins and a ridiculously easy to make mango dressing, this salad is perfect for lunches or easy, light dinners! Optional Add-ins/Toppings: Sliced Jalapeno, Tobiko, Sesame Seeds, Diced Mango, Wonton Chips, Cilantro, Chopped Macadamia Nuts, Shredded Carrots, Sugar Snap Peas, Sliced Radishes and/or Pickled Ginger. Prepare the dressing: In the bowl of a food processor, add the mango, lime juice, honey, mirin, sesame oil, sriracha and 1/8 tsp salt. Process until completely smooth. With the motor running stream in water, 1 tablespoon at a time, until desired consistency is achieved*. Taste and adjust for seasoning. 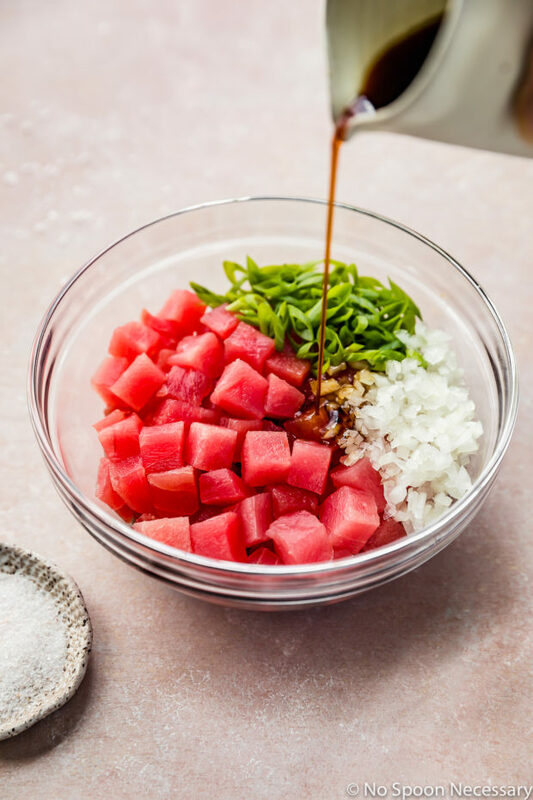 Prepare the Tuna Poke: In a medium bowl, combine the onion through the sesame oil. Season with a generous pinch of salt and whisk well to combine. Add the cubed tuna and toss gently to combine. Assemble the salad: In a serving bowl, add the lettuce, seaweed salad, avocado and cucumber. Top with the tuna poke mixture and optional toppings . Drizzle with dressing. Enjoy! Nutrition information based on 4 servings. The add-ins for the avocado mango tuna poke salad bowl are pretty limitless. I have included a ton of options in the recipe, but feel free to use your imagination and top your bowl with whatever your heart desires! 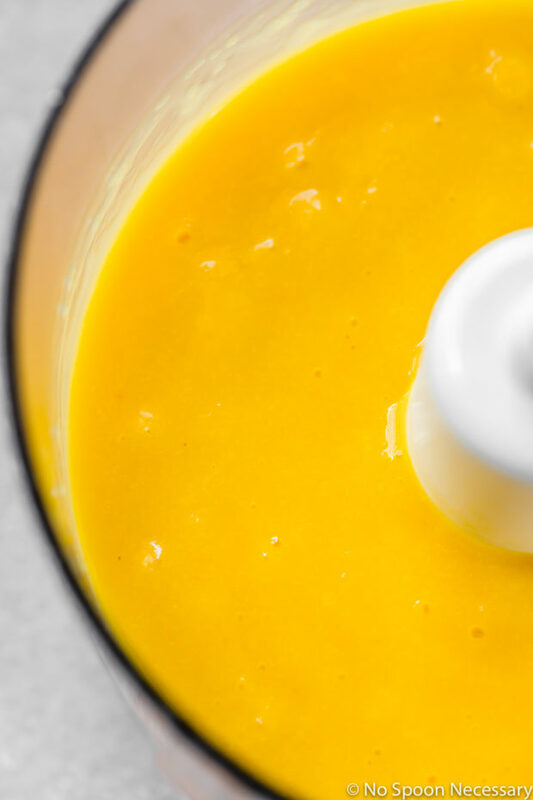 The amount of water needed for the mango dressing depends on your preferred consistency. I recommend starting with 1 tablespoon and adding more water, an additional tablespoon at a time, until desired consistency is achieved. For reference, I used 1 1/2 tablespoons of water in my dressing. The same note applies to the honey and sriracha in the dressing. Always make a recipe your own by adjusting the measurements of ingredients to your taste. I love tuna poke. I’ve never made it at home. I’m not sure where I’d find sushi-grade tuna locally, actually. I mean I’m sure there are places, but I haven’t looked haha. I really should. This looks divine! What a great summer lunch! 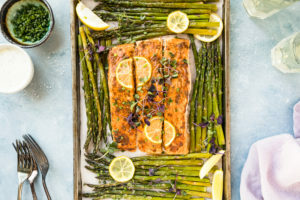 This is such a fresh, fabulous dinner for summertime! I’m a huge fan of mango and avocado together and they sound like the perfect addition to this poke bowl. Gorgeous photos Cheyanne! Happy belated birthday, Chey! Yup, at some point you realize that all that fan including festive food and drinks affect you the next morning more than it ised to be…maybe we should have all this food and coctails every day to avoid gaps and seeing the difference? :) Anyway, this salad is fabulous. I’ve been craving sushi, but why struggling making them when you can get a simplified version in a bowl? This is basically a dream bowl of food for me – honestly, I’d even eat it for breakfast. Loving the combo of avocado and mango and ever delicious ahi! I hear about poke bowls all the time but wasn’t really sure what they were – so the info about the poke bowl was interesting to learn. 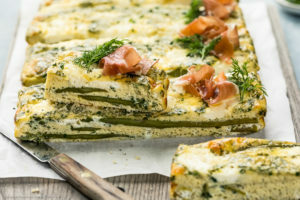 This looks so fresh and good for you! Glad you had a good time with your mom and other dad – my mom was just here are we had a blast! Have a great weekend! You have just combined everything I love in just one bowl. I am seriously drooling here..